For those with the ability (or at least the patience) to decode Supreme People’s Court (SPC) President Zhou Qiang’s March, 2018 report to the National People’s Congress, it provides insights into the Chinese courts, economy, and society, and of course politics. This blogpost will address selected aspects of the second and third parts of the report because of competing time demands. To most of the world, President Zhou Qiang’s reports to the National People’s Congress (NPC) differ little from year to year. However to President Zhou Qiang and the team of people tasked with preparing a draft that would not be thrown back in their faces, the challenges in 2018 were more formidable than previously. This year’s report needed to highlight the SPC’s achievements of the last five years, signal that its work in the next year is harmonized with the post-19th Party Congress New Era, and hit the right notes with NPC delegates, who have in the past voted against court reports in significant numbers. According to this report, the drafting group, which started work in late October (after the 19th Party Congress), and as anyone familiar with China today would expect, communicated through Wechat. The high stakes report meant that President Zhou Qiang summoned members for drafting sessions during the Chinese new year holiday. 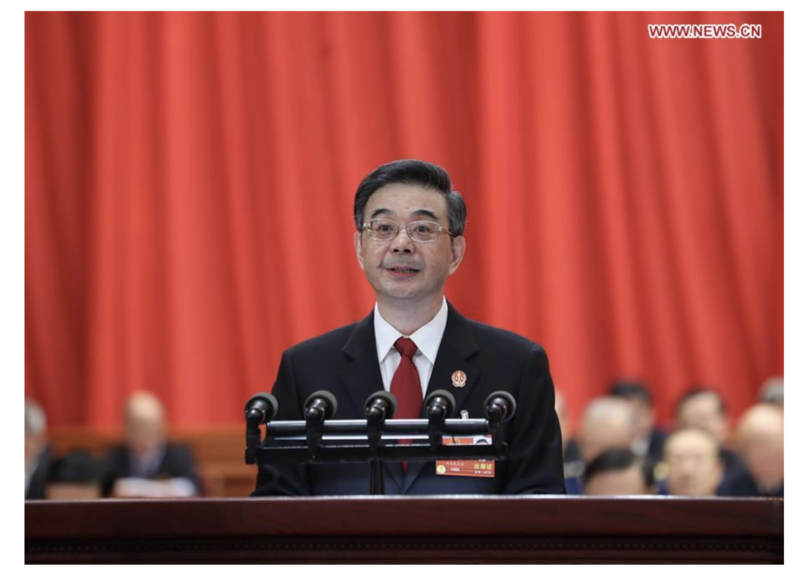 The group submitted 37 drafts to President Zhou Qiang and other senior leaders, and as this blog reported in previous years on this blog, senior court leaders traveled the country to seek the views of NPC delegates and many others. This means (as I have written before, and I have discussed in greater detail in a forthcoming paper) that the statistics have been specially selected. The summary below (part 2) is not comprehensive but provides some highlights. It signals that the work of the SPC is perfectly synchronized with national policy. the SPC promoted bankruptcy trials, including developing a national bankruptcy information platform (limited information available–related blogpost here); issued a policy document on transferring cases from enforcement proceedings to bankruptcy; dealt with zombie enterprises by hearing and closing 12,000 bankruptcy cases (over the last five years); issued a company law judicial interpretation; heard and closed 4,106.000 sales tcontracts and 1,320,000 real estate cases. struck at illegal fund-raising etc. (no statistics). Expect to see more cases in this area in 2018. 4. SPC has improved judicial protection of entrepreneur’s property rights by issuing 17 policy documents (the number may indicate the depth of the problem) (see related blogposts). 5. SPC has supported national innovation policy through issuing an outline on judicial intellectual property (IP) protection, hearing and closing 683,000 IP cases, working on strategies to deal with the issue for both Chinese and foreign IP holders that in China, IP infringement is low cost but protecting IP rights is high cost, trying the Jordan case and the Huawei v. IDC case. 6. In the area of environmental protection, the SPC has issued an interpretation on public interest litigation, and concluded 487,000 environmental civil cases, with 11,000 cases of compensation for ecological environmental damages, 1,383 cases of environmental public interest litigation initiated by the procuracy (one of my students is looking into this), and 252 environmental public interest litigation cases were filed by social organizations. 7. In foreign-related cases, the Chinese courts concluded 75,000 foreign-related commercial and civil cases (note they account for a tiny proportion of cases in the Chinese courts). Although the SPC says that more and more foreign parties have agreed to settle disputes in the Chinese courts, Professor Vivienne Bath’s research has shown that foreign parties are often dragged into the Chinese courts because of principles in Chinese law leading to parallel proceedings. The protection of “judicial sovereignty” has multiple implications (some explained in the linked article). This year, after several years of drafting, the SPC has issued a set of three judicial interpretations on the judicial review of arbitration. Supporting the national strategy of increasing its maritime power, the Chinese courts have heard 72,000 maritime first instance cases. The SPC describes the maritime courts as effectively safeguarding the country’s maritime security and judicial sovereignty. 9. On foreign judicial exchanges, the SPC has handled 15,000 international judicial assistance cases (in fact both Chinese and foreign practitioners complain about how long assistance takes); and the SPC has used international conferences to promote its international role, particularly vis a vis Belt & Road countries. For those with the ability (or at least the patience) to decode Supreme People’s Court (SPC) President Zhou Qiang’s March, 2018 report to the National People’s Congress, it provides insights into the Chinese courts, economy, and society, and of course politics. This blogpost will address selected aspects of the first part of the report because of competing time demands. The summary below (part 1) is not comprehensive but provides some highlights. The SPC heard about 82,383 cases and closed about 79,692 ones, up 60.6 percent and 58.8 percent over the previous five-year period respectively. Much of this caseload is attributable to the circuit courts. For those interested, SPC court hearings (that are being heard openly) are streamed or are saved in a video library on the SPC website: (http://tingshen.court.gov.cn/). (The Supreme People’s Monitor can be seen attending a hearing here). According to a Xinhua report on 10 May, the six circuit courts of the Supreme People’s Court (SPC) accepted 2,922 (and concluded 1909) civil, administrative and criminal cases in the first three months of 2018, accounting for 67.2 percent of the total cases of these types accepted by the SPC. It is possible to view circuit court hearings on-line on the SPC website. A total of 8,355 petitions were handled by the circuit courts (in the first 3 months of 2018), accounting for 78.92 percent of petitions handled by the SPC. It is clear two of the goals of establishing the circuit courts (the SPC near your home (“家门口的最高法院”） are being achieved: 1)moving the hearing of many cases to the circuit courts; 2) moving the processing of most petitions to the circuit courts. It is not clear from these statistics how many petitioners sought to petition the circuit courts (and SPC headquarters) –there are likely many more petitioners who visited than petitions accepted. As was discussed earlier on this blog, the SPC is seeking to involve lawyers in the criminal petitioning (collateral appeals) process. The SPC highlighted that in the past five years it had issued 119 judicial interpretations (some of which have been discussed on this blog, many translated by Chinalawtranslate.com) and issued 80 guiding cases (link to cases and analysis) (as Jeremy Daum has written, and Mark Cohen has also noted, the statistics show they are not often used by the courts), but did not release numbers on the other types of documents it had issued (this blog has discussed some of them) or the number of model cases or other cases issued by SPC divisions (this blog has recently focused on ones issued by the criminal divisions). In keeping with the current political priorities, President Zhou Qiang said the courts “resolutely protect the nation’s political security, in particular the security of the state power and the political system.” Similar to last year, no statistics were given for the number of national security cases heard. He does mention the normative document the the SPC issued jointly with other authorities on religious extremism and terrorism (discussed here). President Zhou Qiang then discusses corruption-related offenses, mentioning the asset recovery interpretation discussed last year on this blog. Thereafter he focuses on property and personal safety-related crimes, mentioning this year’s organized crime normative document (this blog discussed it earlier this year), as well as (among others) its accomplishments relating drug cases and medical violence. He then discussed cases involving violence against women and children (130,000 cases over the past 5 years, food safety (42000) and environmental protection crimes (88,000), and telecommunications crime. Local court white papers have posted detailed statistics concerning many of these crimes (see a Ningbo court white paper on sexual assault cases against minors and a Shanghai district’s court white paper on environmental protection crimes). In the concluding paragraph, President Zhou Qiang discusses SPC participation in comprehensive security management. President Zhou Qiang mentions implementing an additional responsibility system on judges of publicizing the law (普法). This is further to a 2017 notice of the Central Committee and State Council’s General Offices Opinion on State Organs implementing “whoever enforces the law publicizes the law” law publicity responsibility system (关于实行国家机关“谁执法谁普法”普法责任制的意见) that imposes responsibility on state organs enforcing the law (administrative and justice) to publicize the law. Judges are to use court documents, open hearings, circuit courts, streaming of court cases, and posting legal documents on-line to promote the use of cases to explain the law. It is clear that the SPC is taking the circuit court responsibility system seriously, as the SPC’s #2 Circuit Court has been posting a series of articles on its circuit visits around the Northeast (see here). This adds somewhat to judges’ workload, but this type of responsibility is not as great a concern as the more general responsibility system.